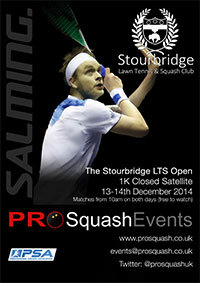 Worcestershire have many entrants into the World Masters and it's free to watch! Jack Young from Manor Park is growing a moustache to raise vital funds and awareness for men’s health, specifically prostate cancer and other cancers that affect men. Worcestershire found themselves in a tough pool in the 1st round matches of the inter-county Racketball competition. Home advantage would be with much fancied and ambitious Surrey while the other place taken by our old adversaries from Hampshire. With Worcestershire players needing travelling time of 2/3 hours to arrive at Surbiton Rackets Club the morning game on Saturday September 17th 2011 saw Surrey and Hampshire meeting for the first ever time. The strong home team coming through comfortably 4-1. 09/03/2011 - Stourbridge Exhibition match and chance of coaching from a World Ranked Player! National Racketball Counties Division 2 completed on Saturday 19th February at Shrewsbury Rugby Club. Read the report here. You'll need to fill it in and send it back to Bett Dryhurst with some money! 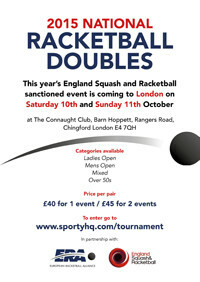 Wolverhampton Racketball Open entry form has been uploaded here. Its just a one day event on the 2nd October with all matches best of 3 games and every competitor guaranteed at least 3 matches. As well as a super 16 A draw there is also a B completion and an over 40s and 50s with the age group categories being used to build the first ever National Racketball National Rankings. 28/01/2010 - Website Speed Update - it's getting better! The main problem with this site it the calculations needed to produce a league table - somewhere in the region 33000 calculations per table. So I did a bit of learning and moved the calculations to the database rather than the pages and now the league pages should load a lot quicker! Next will be the player stats pages as they take a long time too! The results are now available here but I'm lacking in reports of the weekend. If you have anything to add to this page or the site in general then please get in contact with me. There are still 2 games to be played in the main competition and these will be updated when I get told! 16/11/2008 - Webhost switches site off! 10/10/2008 - Results are now being added!